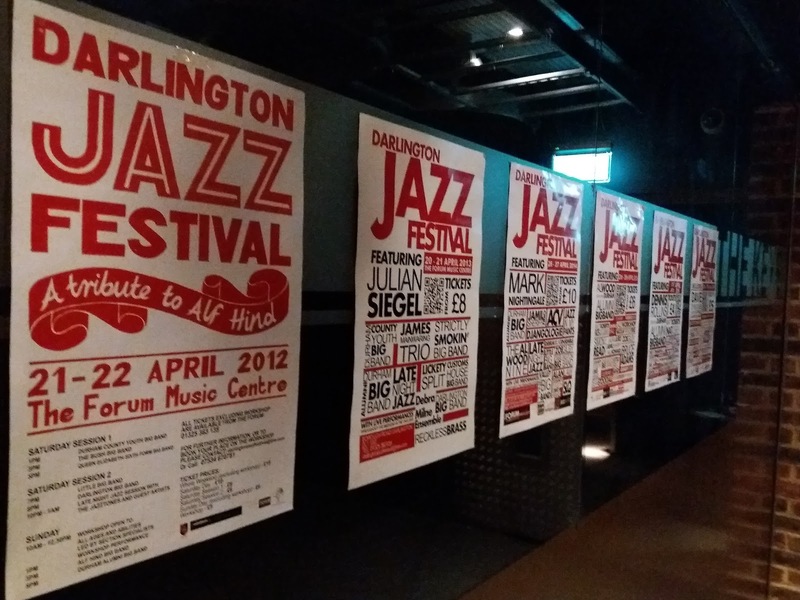 Darlington Jazz Festival goes from strength to strength and this year’s edition, the seventh, has a big name attraction – the ubiquitous Alan Barnes – and a host of top-class musicians from across the northeast region and beyond. Trumpeter Matt Roberts returns once again to participate in his hometown festival, this year playing the music of Kenny Dorham with his promised all-star sextet. When the line-up is confirmed, and here’s a clue, it’s likely to be very similar to last year’s amazing band, it will be standing room only at the Voodoo Café. Al Wood will be involved, similarly, the duo of Emma Fisk and James Birkett, pianist Paul Edis, and Darlington New Orleans Jazz Club will be expecting a full house thanks to American piano virtuoso Jeff Barnhart renewing acquaintance with multi-reedsman John Hallam. 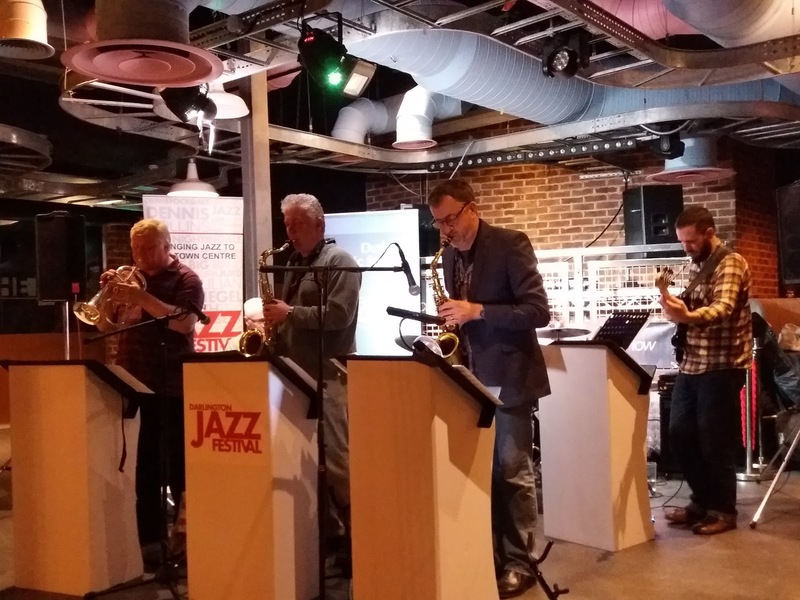 All of this is to come over the May bank holiday weekend (Thursday 3rd to Sunday 6th), however, before then there is much more jazz to come over the coming weeks which began with yesterday’s festival launch event featuring Alter Ego. The Keys on Skinnergate staged the launch day with posters adorning the walls informing those in attendance all about this year’s event. The jazz came courtesy of the bop-inspired sextet Alter Ego. The band made the trip from Tyneside and Tynedale to play two sets to an appreciative crowd. 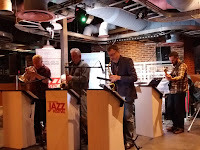 The continued absence of Tony Abell afforded Ian Paterson the opportunity to gig with the band and the bassist acquitted himself with distinction. Blues Marx got things underway with Keith Robinson and Andy Hawking grabbing the first solos of the evening. Get Back In followed, then a new one – Zippit – sounded good with Robinson, alto, and Hawking, keyboards, once again in the spotlight. Mustard Mash has been in the pad a while and it’s always good to hear it. 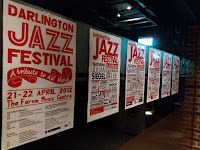 Its composer Niall Armstrong and frontline partner Dave Hignett featured on tenor sax and flugelhorn respectively. The Jazz Messengers’ much-loved sound, propelled by Art Blakey, is, perhaps, a starting point for Alter Ego. No-nonsense drummer David Francis drove the band with quiet efficiency flanked either side by depping bassist Paterson and amiable pianist Hawking. The absent Tony Abell contributed to the evening as composer with his bandmates playing Llangranog Blues. Occasionally Alter Ego up the tempo and on this Darlington gig they did just that playing Hit and Run. Given an opportunity, Dave Hignett will attempt to blow the roof off and so he did on The Perpetrator, Hawking’s Scriabin Scraps further illustrated the band’s multi-talented complement of composers, and again on a tune of Armstrong’s titled Dog Leap Bounce. with less than 2 months to go, there is very little info on the "Jazz Festival" link !